This week marks first visits to two long-standing jazz and cabaret venues. Thursday I hit The Duplex (comments on that adventure to follow in a subsequent post). 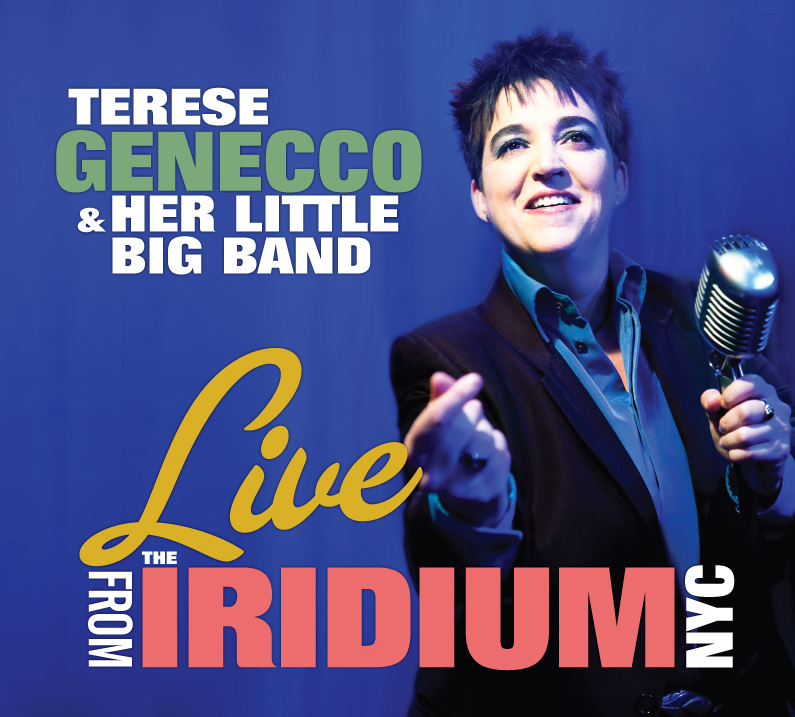 This particular Tuesday evening marks three years that Terese Genecco has appeared at the Iridium and provides the occasion for a pair of performances and the release of her new CD (image at left). As I enter off the over-bright and briefly calm post-theatre curtain Broadway streets, I feel embraced at street level by Les Paul‘s image and instruments and other memorabilia on the walls, the pulsating rhythms of the Little Big Band flowing up the stairs from the subterranean establishment, and soon by an overflowing audience already deep in the throes of Terese Genecco’s first set. I’m early for my 10pm reservation for the second set so I check the room, try to stay out of the way, am parked by the accommodating hostess in the back, and a find a perch on a bench for what turns out to be about 30 minutes of watching the crowd, learning that my booth mate is the grandmother of one of the young guests on Genecco’s stage, and grooving on the sounds and energy. I learn that the sound levels are full and sitting in the raised section in the back might work out just dandy, so I scope the spaces and stake my claim. And I have a riotous good time. Rex Reed at a table with other cabaret familiars during the second set. Murky image by Martha Wade Steketee. Between sets the social scene at the back of the room is warm — the cabaret world as the theatre world more generally is intimate, familiar, supportive. Many in attendance are extended family by blood and by association. Many individuals are familiar to me from other jazz and cabaret events I have attended. 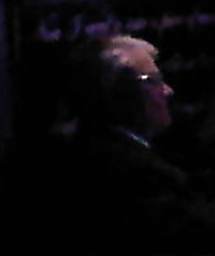 A few people (such as Rex Reed, pictured at right through the dim light of the high energy second set) familiar to me from many years of reading about Hollywood and Broadway. I find my corner, refer to my set list, and settle in. All is not nailed down, set in stone, in these creative set lists. There is some variation between the 8pm and 10pm plans I perceive on paper, and some overlap. And as the 10pm adventure proceeds, Genecco calls a few “audibles” in real time. We don’t hear “Come Rain or Come Shine” and “St. James Infirmary” and perhaps a few others as planned. Genecco notes at the time that the set feels to her a bit too ballad-heavy. While I bemoan the absence of these favorites by other performers, I do note that her energy level is high and her mood seems well matched to the big brassy happily ta-da feel of many arrangements that remain on the final list. “This Could Be the Start of Something Big” with her guest Robert Hicks. “I’ve Got You Under My Skin” in an arrangement modified from the Frank Sinatra–Nelson Riddle version rocks the joint. I find Genecoo’s particular vocal qualities to be more energy than story telling — she is brass and group leader and humor and delight, but not a ballad singer. Her appreciation of her stalwart and delightful band (all men except one woman on percussion) is evident and credit is given on stage and at delightful and appropriate length in the reviewer set list notes (original arrangers, folks for whom those arrangements were done, and who penned the current modified arrangements). And my cross-referencing, researcher-dramaturg’s brain delights in seeing performers and arrangers I love among these credits — Frances Faye, Sammy Davis Jr., Frank Sinatra, Mort Lindsey (for the arrangement of “Come Rain or Come Shine” for Judy Garland Genecco opts not to perform), and Mike Greensill (for an arrangement of “Drunk With Love” listed for the 8pm performance). I know more about the complicated and layered set of influences that inform Genecco’s work in this way, and I appreciate her ear and her heart all the more for it. Genecco and her Little Big Band is an energized delight. And this evening, in context of many that have come before and many that will ensue, builds on names and relationships and shared experiences. Sure, you can drop a name or two among audience members. But we’re all present for the same reason — the music and the camaraderie. And not just in the audience, but on stage overlaps are apparent among gigs. Genecco’s guitarist Sean Harkness, for example, among the 10 band members or so on stage at the large Iridium venue, is part of the trio on stage with Colleen McHugh at the tiny Duplex venue two nights later. Introductions made, family crafted from musical appreciation. Story telling and family building through song.